I’d like to believe Recchia. After all, there are currently no on-street bike lanes headed east-west between his district and that of Vincent Gentile, Recchia’s partner in crime. To repeat, in all of Sunset Park, Borough Park, Bay Ridge, Dyker Heights, Bensonhurst and Gravesend, there’s not one east-west lane that runs for more than a couple of blocks. I’m sure, therefore, that as soon as Recchia proposes his alternate location, DOT will jump at the opportunity. Perhaps Recchia wouldn’t offer an alternative because articulating what exactly was wrong with the Bay Ridge Parkway lane would be nearly impossible without having to drop the pro-bike pretense. After all, a DOT presentation on the proposed bike lane [PDF] promised that striping it wouldn’t require taking away a single travel lane or a single parking space. Where space was tighter, the bike lane was to be sacrificed, with sharrows replacing it. It couldn’t be that the bike lanes would overly constrict motor vehicles. Even with the addition of five-foot bike lanes, moving traffic would have 11-foot lanes in each direction. To put that in perspective, 12-foot lanes are the standard for interstate highways. On Bay Ridge Parkway, an urban street with only one lane in each direction, all that excess room for cars just causes dangerous speeding. And it isn’t that Recchia’s constituents would never ride a bike. A majority of households in his district don’t even own a car and of those that do, not all drive to work [PDF]. His many transit-riding neighbors might appreciate the opportunity to safely ride a bike to the subway instead of waiting for the bus, or to bike for short trips and neighborhood errands. Those who already ride desperately need better bike facilities: cyclist Joseph Granati was killed in a collision with a driver in Gravesend just this Sunday. It is true that both Community Board 10 and Community Board 11 opposed the bike lanes, according to the Times. 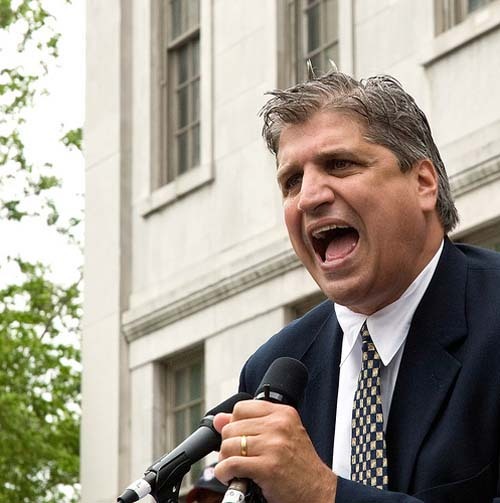 But Recchia is a popular leader in his community who knows the district as well as anyone and who was elected to represent it. If he really believes there’s a place for bike lanes, he should say where and make his case. The community boards would at least hear him out. Until he does that, Recchia can’t have it both ways. He can’t claim he’s not against bike lanes as long as his only public statement on the issue is to crow about killing a plan for the only east-west bike lane in the area. He can’t say there’s a place for bike lanes without even hinting at where that might be. We’d love to be proven wrong, but for now, Recchia counts as a full-fledged captain of the bikelash. Indeed, he holds one of its biggest scalps. Does Transportation Alternatives have any members with Bay Ridge Parkway home addresses? Why not start there? I’d be willing to bet money that Bay Ridge Parkway homeowners would be happy to have DOT come and traffic-calm their street via a new bike lane and various other improvements. I would bet that once you strip away the irrational, tabloid-driven bikelash baloney and get the community talking about what kinds of improvements they want to see on Bay Ridge Parkway you’d find that Recchia and the Community Board are not, in fact, accurately representing their constituents views on this one. Riiiight.. It’s like the NRA. They always say they “support existing gun laws”. They omit the fact that every single one of them was passed over their opposition. My impression is that the homeowners on 75th Street (it rarely is called Bay Ridge Parkway locally) would likely be mixed to opposed to a bike lane because of one major issue, double parking. As I have stated elsewhere, I also have mixed feelings about 75th Street. Over the years I have done lots of east/west biking. I rarely ride on 75th and when I do it is only for a few blocks at most. Traffic on 75th Street is problematic with speeders and idiots who pass on the right especially at intersections, as well as multiple double parkers. From a cyclist’s perspective simply putting stripes on 75th Street with much of it in the door zone is not going to do much to make it more appealing. I would still mostly use side streets and have always used side streets on group rides that I have lead. On the other hand, a bike lane should help calm the traffic somewhat and 75th Street could use calming. Also, I don’t like to see politically driven pull back related to the expansion of bike lanes. And the reasons given for why 75th Street was not appropriate are mostly BS. Yet as a local cyclist, it doesn’t strike me that it will ever be a pleasant long ride even with a bike lane. Thanks for not letting him off so easy. While I have been on the bus there, I have not had much occasion to ride there, and now I will have even less, but the DOT proposal sure makes it look like this lane was a no-brainer; extra wide travel lanes narrowed with bike lanes and left-turn bays and sharrows where the road is not quiet as wide. No lost parking or lost car travel lanes, just a little more order to the road for everyone. If this really wasn’t a good case for bike lanes, there never would be one. Biking east on 75th Street(BRP) to Coney Island is a natural. It becomes Stillwell Avenue up at Bay Pkwy and takes you exactly where you want to go: Nathan’s! Bike lane, I don’t know. In Bay Ridge this is doctors’ row and there are always cars stopped to pick-up the elderly. West of 4th Avenue is too narrow, that’s conceded. This is not Core-City or even the Inner Ring; this is Brooklyn exurbs. Too much speed there, of course; but they can begin to calm it with a painted median two-to-three feet wide(like Narrows Avenue) and paint in a Class 3 bike paths. Should alert all drivers. Tom, we are only talking personal preference, but I prefer making my way to Bath Avenue to head out to Coney Island and avoiding the speedway followed by the “el” on Stillwell and also avoiding 75th Street. I am going to go out on a limb here and say that communities should NOT get the final say on whether they want bike infrastructure going through their neighborhood. Bike lanes, like roads, are used for getting from place to place, and nobody — even those who live there — should be able to say I don’t have a right to safely travel through their neighborhood. They can make suggestions on improvements, but they shouldn’t be able to deny the underlying infrastructure. Shall we re-visit auto traffic in Prospect Park? All of southern Brooklyn feels it was overruled by Park Slope alone. Just because there isn’t a bike lane, doesn’t mean you can’t ride on the street. I regularly ride on Bay Ride Parkway. It’d be nice to have a lane, but it doesn’t restrict riding at all. Also, referencing a bike death located 5 blocks east and 5 blocks south of the proposed bike lane seems extraordinarily misinformed. Careful. You’ll run into the converse, where neighborhoods are asking for traffic calming and lane reductions, and people from outside the neighborhood complain that the people on that street are being selfish in closing down what should be a traffic arterial. Reference: Cesar Chavez in San Francisco. The Community Board's goal is to "establish a safe east/west connection for cyclists," the board chair and district manager said in a letter to DOT. Finally, Bay Ridge would enter the 21st century, thanks to a city plan to put a protected bike lane on Seventh Avenue. 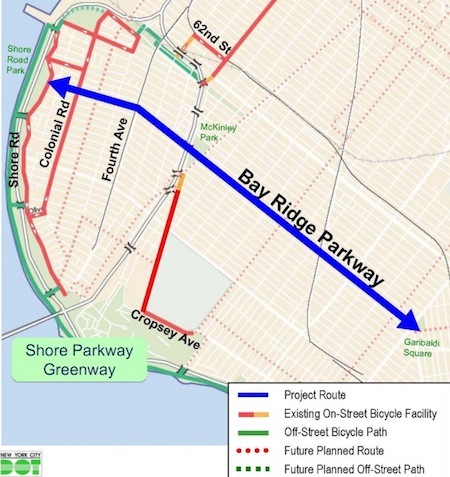 The good news: A long-sought bike lane on Bay Ridge Parkway may be back on the drawing board a decade after it was unceremoniously buried by Community Board 10.